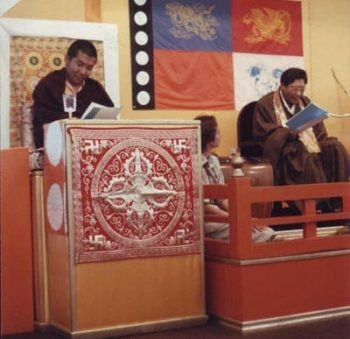 This is a two-part article on the practice of elocution as taught by Trungpa Rinpoche. Part one (below) is a 1999 interview with Joel Metzger for a web-based journal called Online Noetic Network (currently off-line). 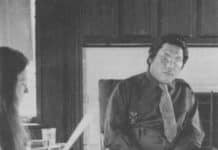 In part two, Form As Practice, Carolyn answers questions from CTR biographer Fabrice Midal about how Chögyam Trungpa worked with students through elocution and other forms of discipline, and the nature of form as path. 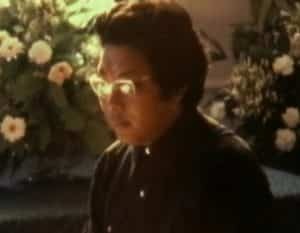 Chögyam Trungpa recites from The Elocution Home Study Course, circa 1985. Joel Metzger: To me elocution training sounds very formal and proper. Carolyn Gimian: Very proper, yes. Chögyam Trungpa liked a lot of things about England, but there were also many things he didn’t particularly like. He found that in general there wasn’t an open climate for him to present the Buddhist teachings. Some people were interested, but he did not have many serious students there. There was a real distance that the English wanted to keep between themselves and the teacher and the teaching. So he was, I think, exhilarated by coming to the United States and to Canada and North America. He found it to be a very fertile ground for the presentation of meditation and the Buddhist teachings. But, he also found that Americans tended to have very bad speech patterns. From his point of view, people in the United States, I think, murdered the English language. They swallowed the ends of words, they didn’t enunciate clearly, they spoke very quickly, and they had a very nasal pronunciation. After spending about thirteen years in the United States, he decided to try out a method of elocution to address some of the problems that he saw in the way people approached language. It wasn’t just the pronunciation issue, but it was also an issue of recognizing the power of speech, connecting mind and body through speech, and seeing speech as a tool or vehicle for a powerful level of communication. Prior to this, in the 1970s, he had tried an approach, with a few of his students, of teaching them a mid-Atlantic rather snobby Boston accent as a way of pointing out to people what they were doing — or not doing with their speech. That approach didn’t get him very far, so he dropped it, and some years later, he decided to teach English as he had learned it, to teach Oxonian, as a method of waking people up to what was going on with their speech. Joel Metzger: Oxonian is very proper speech? Carolyn Gimian: Yes, proper Oxonian English. Joel Metzger: Prior to your training with Chögyam Trungpa, you hadn’t received any previous training in elocution? Carolyn Gimian: No. Nothing. I wasn’t looking to be trained in anything either. I wasn’t interested in being trained in anything. This all started in 1983. 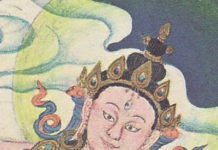 I was invited to visit Rinpoche in an isolated retreat situation in an old mansion in the country in New Hampshire, so that I could work with him on a book, Shambhala: The Sacred Path of the Warrior. I thought we’d mainly be working on the last chapter of the book. 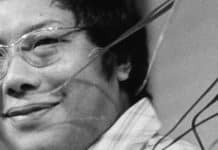 When I got there, I heard from other retreatants that Chögyam Trungpa had written some exercises — elocution exercises — that he was trying out on people, and that everyone who came into that situation was “subjected” to trying this method of elocution. Generally, new visitors to his retreat were invited to do elocution the evening after they arrived. You would try and you hoped that you’d be spared after that, and the next person who came through would be the next guinea pig. When I went into this situation, I don’t think I realized fully what was going on. I really thought I would get away with trying elocution out once or twice and then be left alone, because I wasn’t really interested in elocution, not at all. 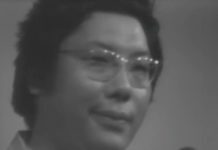 For whatever reason, Trungpa Rinpoche must have thought I was good at it — or had some potential — because he just zeroed right in on me and very quickly decided I was going to be his pet project for teaching people how to do this. He was going to teach me to speak proper Oxonian. I was in this retreat with him for almost a month. We were somewhat cut off from the outside world, and I didn’t have anywhere to go, so I got a lot of training in a short period of time. I worked with him for about a year or two. Then I started teaching elocution, mainly to small groups of people. Basically, I began to teach people what I had learned, in the way that I was trained. Most of the people who were interested were other meditation students. Rinpoche himself was teaching elocution to people everywhere he went in 1983 and ’84. So people heard that he was doing this, and they became interested in learning more about elocution, because they were interested in him and his teachings. So I was a vehicle for them to study the method of elocution that he was presenting. That made it very popular, for a little while. Elocution is something that has affected me profoundly, and as such it’s something that I am happy to share or to teach other people. This is not my primary focus or my livelihood, by any means. I do it occasionally, if people are interested. Joel Metzger: What does elocution mean? What is the training you do? Carolyn Gimian: This method of elocution is divided into three parts. It’s a three-fold path, we might say. 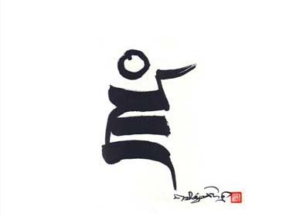 Chögyam Trungpa talked about this in terms of the three-yana approach to Buddhism. The first part of it involves actually learning to speak and do these exercises in Oxonian English. Oxonian is a very strictly pronounced accent, a very pronounced approach to language. 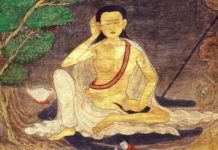 Learning to mimic this style of speech corresponds to the Hinayana, or the narrow path of discipline in the Buddhist teachings. The middle ground of this path is essentially staying within that discipline, but relaxing within it. At the beginning it’s very awkward for people. One’s speech is very forced and you might find it slightly embarrassing and somewhat humiliating. Then at a certain point, if you keep going with it, you begin to enjoy it, to relax with it and to get into it, and that’s the middle ground. This corresponds to the Mahayana. You begin to understand that you could capture the essence of a word, the power of a word, by how you pronounce it. The ultimate idea of this method of elocution is not to change your speech so that you’re speaking Oxonian English all the time, but rather to come back to your normal, natural way of talking whatever that is — whatever your native accent might be — having it informed by having done this training. This corresponds to the Vajrayana level of elocution. At this level, you begin to appreciate the power of speech and you develop the understanding that all speech is onomatopoeia of some kind. You begin to understand that you could capture the essence of a word, the power of a word, by how you pronounce it. First of all, pay attention to your own speech. Pay attention, not just to what you’re saying, but to how you talk. Listen to yourself talking, so that you hear yourself. Secondly, listen to other people and how they speak. Again, the focus is not primarily on the content, but the point is to actually pay attention to how people talk. Thirdly, enunciate clearly. That’s quite straightforward. Fourth, slow down your speech, not hugely, but slightly, so that you pay more attention to speech and you put more emphasis on individual words. Fifth, simplify your speech. The point is to realize you don’t have to use as many words or talk as much as you think you do. The sixth principle is to pay attention to the space around words. When you talk, you don’t just pay attention to the speech or the words themselves, but you have a sense of the whole space. So those are the six principles of mindful speech, and essentially they’re a mindfulness practice. You could practice this all the time, but practically speaking you’ll forget about the principles of mindful speech quite a lot. So a person would never have this kind of conscious speaking happening all the time. But when you remember these principles, when you are conscious of your speech, then you can apply these things. It’s having a light touch of discipline in your speech. Elocution can be very helpful in everyday life. If you want to communicate with someone, you often think about what you’re going to say. This is particularly true in a “charged” situation, say you have to give a speech, or you are going to see a loan officer to apply for a loan, or you have to appear in court because you got a parking ticket, or you’re going to propose marriage to someone. People often run the story lines through their heads, or they write out the speech that they’re going to make. However, people generally don’t really think about how they speak. They’re just thinking about what it is they’re going to say. The idea of elocution is that this discipline helps you in your everyday life, as well as being an every-moment approach to discipline. Trungpa Rinpoche used to say that if you are stopped by a policeman and you use good elocution, you may avoid getting your speeding ticket. When I teach this to children, I tell them, if they use good elocution and ask for something from their parents, they are more likely to get it. It’s a kind of crude approach, perhaps, but….well, you could get A’s in your tests. Elocution allows you to communicate clearly. I find that when my own speech is fuzzy, it’s often because I don’t really care about what I’m saying or I’m not really sure about what I’m saying or I don’t believe in what I’m saying. On the other hand, I think when people have something really important to say, they’re often afraid to proclaim it, and they may swallow their words. They might say something that is quite meaningful to them, but they do so in a way that they hope nobody will notice. Joel Metzger: When I think about the idea of elocution, I picture an English schoolmarm! Carolyn Gimian: Right. Sure. There are many books written by those kinds of people in the early 1900s when elocution was quite popular. You can find them in used bookstores in England. I bought a number in Oxford when I went over there in 1984. However, with a genuine approach to elocution, it’s anything but schoolmarmish. It can be quite frightening to speak out, embarrassing and revealing, and it’s quite hard work. This discipline is not something you’d be attracted to for fun, necessarily, but it’s something you might want to develop for success in your business or to create a good impression. Then there’s a whole other level to it, beyond the impression you make on other people. It’s also an awareness practice. Beyond that, elocution may be connected with poetry and art: the love of words. Awareness in your speech is very closely linked to your thinking, or what is called mindfulness of mind. Awareness in your speech is very close in that way to your self-awareness altogether. To be aware of your speech, to be mindful of your speech, is a very important thing. It’s similar to kyudo practice, the practice of Japanese archery. You are doing archery with a target, but you don’t worry so much whether you hit the target or not — whether you get a bull’s eye or not — but you are concerned about whether your form is perfect and whether you’re doing this with mindfulness, with awareness. In this way, elocution could be a meditation practice too — being aware of your own speech. Joel Metzger: For sure. 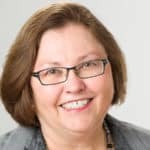 So, you are looking at improving speech with a purpose of self-awareness, instead of trying to teach from the trying-to-make-a-good-impression point of view? 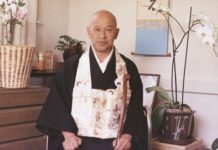 Trungpa Rinpoche pointed out that you can hear things about people in their speech — you can hone in on their hesitation or confusion. Carolyn Gimian: The way in which this particular method is taught is based upon wakefulness. Waking people up. If you want to learn this form of elocution, you need to have some kind of one-on-one instruction. And that instruction is very particular to a person’s speech situation and to their kind of body-speech-mind. 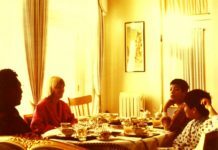 Trungpa Rinpoche pointed out that you can hear things about people in their speech — you can hone in on their hesitation or confusion. A lot of the way one speaks is based on habitual pattern and preconception, rather than being based on anything fresh or spontaneous. What Rinpoche would push for when he was trying to do elocution with me or with anybody was a fresh spontaneous moment. In its simplest form, this approach to elocution is based on hearing a sound and mimicking that sound — you try to reproduce that sound yourself. When you have a blockage there, it’s usually completely conceptual. You’re just not hearing the sound, because your mind gets in the way. It’s like looking for something but not being able to see it, even though it’s right in front of you. In this case, you’re not hearing it. Once you hear a sound or a word without preconception, then you can speak it….I don’t know how to say that any other way. 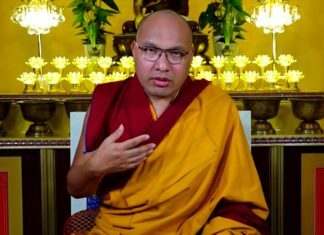 Joel Metzger: I listened to a tape of Trungpa Rinpoche teaching elocution a little bit last night. I heard people speaking and then Trungpa Rinpoche corrected them. I could hear nothing wrong with their speech — even after hearing his corrections! Carolyn Gimian: Yes — right! It’s subtle. But the students eventually get it. Joel Metzger: It must make students very self-aware. Are people self-conscious when they speak to you? Carolyn Gimian: No, I don’t think so. If they’re self-conscious, it’s not because I’m thinking about elocution all the time. Far from it. This technique is not a judgmental approach, either. It’s not about good or bad. People may misinterpret. In fact, it doesn’t matter what your accent is. You have the same potential to practice this form of elocution no matter how you speak. Everyone has the same potential. I don’t know how it works for people who start out with an English accent. I have worked with a few people who grew up with an English accent, or an Australian or South African accent, but most of the students I have had are from North America. This approach to elocution is basically mind training, even though it is also elocution training. If you already have an upper class English accent, it might be harder to appreciate the mind training aspect of this discipline. It would be absurd for people from England — from their point of view — to learn English from me, right? They wouldn’t think of themselves as needing this training, if they think of it purely as a way to learn English. And their approach to elocution would tend to be based on their own experience growing up learning English and being corrected. Most accents are transmitted by some kind of training people receive from their families. Certainly what one might call upper class accents in England are “received” speech. You get some training in school, and your accent may depend on how people speak at your school, and how your parents speak, and how they correct you. But in this approach to elocution, the emphasis is on mindfulness training, which has nothing to do with the accent per se. It might be harder for a person who already speaks Oxonian or upper-class English to understand this. Joel Metzger: I’m interested in the idea of mindfulness practice being so closely related to thought, and being closely related to expression. How does awareness of the way you express yourself reflect awareness of yourself? You express yourself in a certain way … but what you are is different than that. Carolyn Gimian: I don’t know. I guess I don’t think about it quite that way. I think about awareness in terms of almost a non-thought. When everything is synchronized, coordinated in your body, speech, and mind, then there is a sense of being or a sense of presence, and the issues of internal and external or whether you and your speech are the same thing — those kinds of things don’t seem very relevant. In that situation, you’re just one thing, one whole thing. There is just the sense of wholeness. That has been a powerful experience for me in working with elocution. You experience what one might call a quality of focus or one-pointedness — I suppose you could use the word focus for this feeling of being on the spot. Joel Metzger: Feeling of being on the spot? Carolyn Gimian: In a positive sense, you are not intimidated, but just right there on the dot, on the spot. You’re just there, and you’re projecting out into the space, and there’s a sense of interaction and communication that is very powerful. The question of who am I or what I am isn’t really very relevant in those moments. This kind of transcends thinking about who you are. Joel Metzger: Does everybody need elocution training? Carolyn Gimian: I think anyone can benefit from it. Whether or not they need it …. I would feel a bit arrogant saying people need it. But I think that people can benefit from it. It can address particular issues that people have with their individual speech. Not necessarily in a direct way; the effect could be indirect. People may feel that there is something about their speech they don’t like, something that is problematic. This can be a way to get at that, in a non-judgmental way. I suppose you could say it is a form of speech therapy. I also think that people can benefit generally from elocution because being conscious of your speech leads to greater awareness altogether. Most people are generally unaware of how they speak and of how they affect others through their speech. This is an avenue to increase awareness, and it’s something that people can do that’s not just philosophical. It goes along with a lot of other mindfulness practices. It’s also fun when it’s done properly. It’s not the old school marm holding the stick over you if you say the word the wrong way. It’s more like learning to appreciate poetry — ultimately, I think that’s what elocution really is. For me it has been. I have a much greater appreciation of language as a result of practicing elocution. I learned from my teacher to see language altogether as some form of onomatopoeia, which is part of this method. You come to recognize that, when you say a word, you can embody the word if you say it properly. 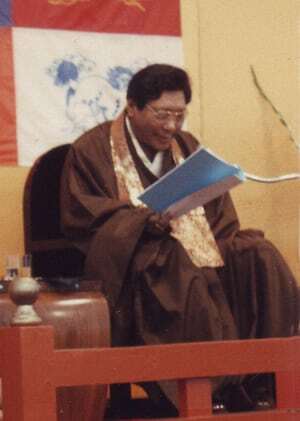 Chögyam Trungpa’s correction method was designed to elicit that from people. It wasn’t necessarily the case that the only reason he corrected people’s pronunciation was because they were pronouncing a word incorrectly. When he was asking someone to say a word like “fabulous” over and over, he really wanted them to embody that word, and take that on — take on that quality or that thing. Joel Metzger: Which is much more than pronunciation. Carolyn Gimian: Oh yes, much more. And it comes out of nowhere. You can’t think your way there. You can’t analyze it. The best words are the ones that you have the most trouble with — which of course is similar to many other disciplines. The hardest things are the best, the most productive ultimately. Joel Metzger: Thank you very much, Carolyn. Originally posted on the Chronilcles in August 2005.